though it was scheduled to close for the season in a week. The weekdays were quiet and somewhat private. The sites were narrow and most were short, but we found a suitable spot and settled in. The daytime temps were comfortable in the 60s, but the nights did drop to the 30s quickly. We were grateful for the small propane heater that we recently added to the system and it took the morning chill off the trailer. The first night Phil noticed that the batteries were draining quickly and we couldn’t find out why. The following day, Phil discovered that the electrical brake wire connection had dislodged after parking the rig in the skinny site. Once he reset it, all was well. We were in a shaded spot with limited sunshine and did use the generator after a heavy rain and a cloudy couple of days for a couple of hours to recharge the batteries. Diamond Lake campground has it’s own beauty with a nice lake to kayak in if the water were not being treated for bacteria. There were warning signs not to let the pets swim or drink the water. Kayaking was not ruled out, but it was at your own risk. We decided not to kayak with our learning curve so steep at this time. The water is very cold and although we haven’t tipped over, it is a likely possibility. We enjoyed the 1.8 mile level walk around the lake with numerous bird and critter sightings. We stopped for a picnic lunch about half-way around the lake and rested before completing the trail. The movie at the museum was full of information on the area and the seismographic monitoring. 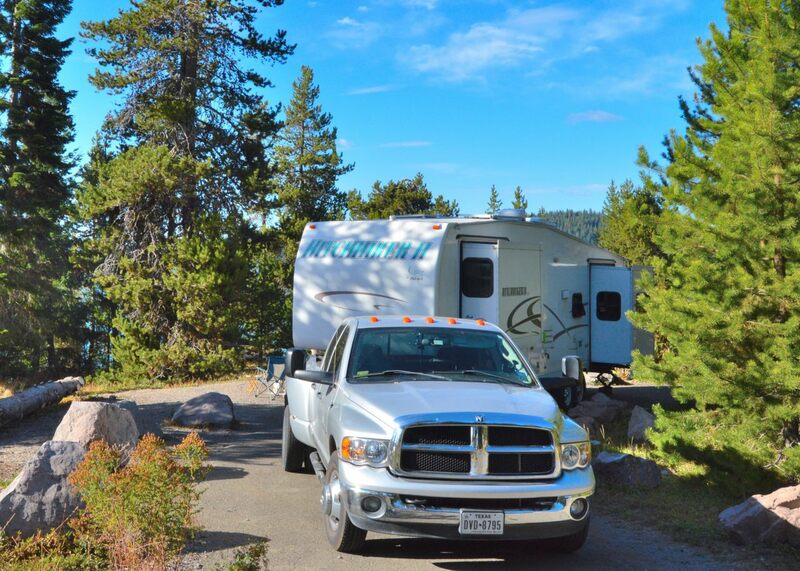 The campground is not far from Crater Lake with it’s deep blue water. We were breathless at the scene. It is a beautiful sight. It was discovered by accident by the gold prospector, John Hillman in 1853. He called it “Deep Blue Lake”. The natives considered it sacred and kept it a secret and I can’t blame them for that. It is majestic!